Stanley No.H12221/2 USA Vintage 12" combination square (please see description). THREE FOLDING CARPENTER RULES Classic vintage carpentry tools. Vintage minty STANLEY “WARRANTED” No. 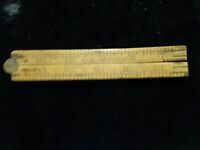 61 2’ boxwood brass bound folding rule !! !